$102 Adventure Game Challenge community · Posted in Post jam version etiquette? Please don't update the game available while the judging is ongoing. What most people do is continue to work on the game, and then upload the new version after the judging ends. 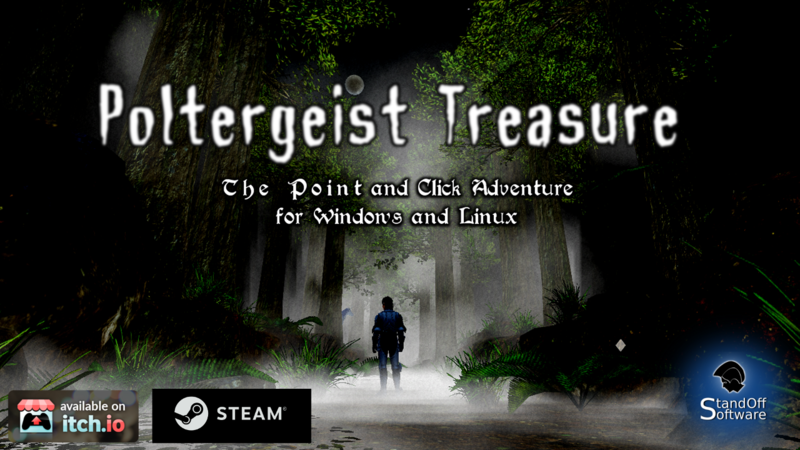 Poltergeist Treasure is an absurdist comedy point & click adventure game set in the strange (and often silly) magical land of Artovya, but actually just in a forest. As the brave knight Sir Typhil of Creulor continues his quest to bring a unicorn to the castle and be crowned king, he finds himself trapped in a haunted forest by a malevolent ghost. Ok, here is a slight change to the rules. You are now allowed to fix FATAL bugs that prevent the game from being playable as long as you do it soon. It is still not permitted to fix non-fatal bugs, or to polish or add to the game. But if there is a bug in your game that absolutely prevents the player from finishing it, you can fix it, but you must either reply here or PM me in Discord and let me know you did so, and what the bug was. $102 Adventure Game Challenge community · Replied to BASIC Studios in Jam Theme! Yes. In fact, I think every single game made takes inspiration from other games. Just don't, ya know, directly copy it. $102 Adventure Game Challenge community · Posted in Is it recommended to post alphas? It's up to you. The only reason I could think to do that is maybe if you want to ask people to test it and get feedback? I won't be playing any of the games until the jam ends, as I don't want to have my opinions skewed by playing early versions. I will wait until the final versions are submitted and the jam is over and then play all the games. $102 Adventure Game Challenge community · Replied to kato-san in must point and click? Yep. That is certainly an adventure game. Also parser graphical adventures from the 80's like the original King's Quest or Space Quest games, or a modern example of the same interface: Snail Trek and a few others. Also modern Telltale games, while extremely light on the puzzles, also count as adventure games, at least for the purpose of this jam. There are other examples and interfaces too but those are the ones I can think of right off the top of my head. $102 Adventure Game Challenge community · Posted in must point and click? Point and click interface is not a requirement. However, I watched some gameplay footage of Cave Story and it is clearly a platformer, not an adventure game. It would not fit this jam. See my response to the topic "Encouraged design pushes? (Jam genre clarification)" in which I have attempted to explain what an adventure game is. Someone is faced with a problem and all options available seem to be unethical or bad. $102 Adventure Game Challenge community · Created a new topic Jam Theme! The theme of the jam is: Ethical Dilemma. The game must be based on a situation in which there is no clearly ethical way to proceed and must have at least two different endings based on player choices regarding the dilemma. The dilemma can be comical or light-hearted, or serious but it must be what the game's plot is centered around. There most certainly have been Adventure games with RPG elements. Notably the Quest for Glory series, and more recently Quest for Infamy. Including RPG elements is fine, but as stated in the rules it must be clearly and primarily an adventure game. It should be long enough. That's what my university professor always told people who asked how long an assigned essay should be :-). But it's absolutely correct. There is no correct or minimum length. or maximum. The judges will do their absolute best to play the game until the end. If the game is too buggy or obtuse to finish we may not get to the end, but we will try our best. $102 Adventure Game Challenge community · Posted in Adventure games examples? $102 Adventure Game Challenge community · Posted in Are browser games acceptable? If someone on Windows with a web browser can play the game, you're good. 1. If the thing that you make can be called a tool, like it can be re-used to make many games and is not specific to this one, then yes, it is fine to develop tools before the start of the jam. Essentially in your example, you would be making the functionality that something like Adventure Game Studio or Adventure Creator provide, and since it is fine to use those products, it is also fine to create your own similar tools before the jam as well. 2. Yes, it can certainly have sub-genres. The requirement is that it be clearly and primarily an adventure game, but sub-genres are fine. It's narrative focused. Not just some narrative tacked on. The narrative is the entire reason someone would be interested in the game. Puzzles are tightly woven into the story. The puzzles are the significant plot points in the story, not things you do outside of the story to arbitrarily block your progress, and not abstracted out to a different kind of activity. Puzzles are how you progress through the game, and every puzzle solved moves the story along in a tangible way. Lastly, it is not clearly any other kind of game besides an adventure game. If it looks and acts like a... match 3 game, for example, that's the kind of game it is no matter how much it might can be squeezed into the adventure game box with enough mental gymnastics. 1. No, these are clearly Puzzle Games with a very minimal plot tacked on. 2. No, card games and turn-based strategy games are not adventure games even with a plot tacked on. 3. I'm not exactly clear what you mean. Minecraft is clearly not an adventure game, but it seems like you mean something else that is sort of like Minecraft but has "events?" I guess it depends on how much these "events" cause the game to resemble an adventure game. I can't say for sure whether this is or is not an adventure game as I'm not entirely sure what the gameplay would entail. Certainly being able to build or have influence over the world does not stop something from being an adventure game in and of itself though. 4. I watched a bit of a gameplay video for the Aurora Wager. It looks like a sort of rogue-lite building and flying game. It is certainly not an adventure game. I skipped around in the video quite a lot and saw no indication of a narrative, just flying around and gathering things so you can continue to fly around. 5. You are right. RPG's are not adventure games. I definitely am a fan of pushing the boundaries, but for this jam, you do have to stay within them even if you push them a bit. I would say all of your examples are very far outside the boundaries. I also like a wide variety of different types of games. It's just this particular jam is only for adventure games. Sure I'll put my hat in the ring. What do I do to enter? Very interesting prototype. I think a whole lot of interesting things can be done with this concept. It really sparks the imagination. Cool game and nice character design. Had to play it a few times over to see how many hearts I could get. Very calming and cathartic, and the art is really great. I feel like maybe I should wake up every morning and play this game. Very interesting puzzle game. I had a lot of fun with it. Had to take a few breaks to stop from getting motion sick from all the spinning but I kept coming back to it. I love the simple but cute character as well. A fun and very fast paced game. Although I like all the heavy story-based games in this jam, this was a nice change of pace to just shoot some darkness and show em who's boss. Nice job. Very interesting messages with multiple stories going on at once. And they often come in the wrong order so it's very interesting to try to figure out the whole story of each character. Eventually the messages stopped showing up whenever I got a new packet even though I could keep flying around and getting new ones, the new message never appeared. I assume this is the end of the game when this happens. Even though I have no children and so can't relate to this exact situation, the experience of looking for something specific and instead finding memories to relive is a very familiar one. The writing was so evocative as well that I could feel what this character is feeling. I played this over and over because I always felt like I needed to know what happened for every choice I didn't choose. Every choice in this game felt so real from the very first one about waking up late and whether to even get out of bed. All the choices made me consider what I would do and how I was feeling. Except thankfully I don't go to that many funerals. I gave it one more try and managed to get to the end! As I mentioned before, I actually really like the music in this. The graphics also work well for getting across the point. The fact that you can get stuck and have to restart the game is a bit confusing, but I suppose it makes sense. I'm glad I went back and gave it one more shot and figured out how to finish it. Now I actually kind of like the fact that it's confusing and seems possibly like it's completely broken but if you keep trying over and over, you can find a way out. Cool stream of consciousness experience. It felt very much like being inside a dream. What a unique and interesting art style first of all. The art sets the mood for the game right off. It's very interesting how your choices affect the game and so seem so important. Yet in the end, it doesn't ultimately matter. Great experience. Awesome. Great art and great story. Love the mystery of figuring out what's going on until it all comes together at the end. Thanks for uploading the zip file instead. Now I was able to play it. I'm really impressed with the amount of work that went into this game. The graphics are great, and the music creates the perfect ambiance for it. In the end, you just have to die right? It seemed like everything was blocked and there was no way out. Wow, very well done. Such a short game and yet accomplishes so much and portrays the emotion perfectly. I like this game quite a lot. It shows me I'm not alone in how I feel and in the end it has a hopeful message. Maybe everyone always feels like this but they hide it so everyone thinks they're the only one. I really like that the character's are just scattered pixels. I also like that I can just walk into the corner and look like part of the wall and pretend I don't exist, although I don't know if that functionality was intentional. Hmm so it's running now, but I can't figure out anything to do. the character just keeps moving up until can't move up any more than can't do anything. It's hard to tell if this is intentional or if this game is even meant to be playable, it is called Brain Sludge after all. Maybe it's just supposed to be a confusing mess in which you can't do anything? I do like the music and the graphics though oddly enough. It's totally my style. I just don't know if this is supposed to be a playable game or not.